Not a day goes by I don't think of something special, funny, or delicious I experienced in France. One of the highlights of my trip was cooking in a restaurant kitchen in Paris. I've been waiting for just the right moment to tell you about it and finally that moment is upon us. Kelsy (who you may remember guest blogged here about those delicious sloppy joes!) was searching for cooking classes and stumbled upon an opportunity of a lifetime. She told me about Un Jour Un Chef's concept... Vouz vez les recettes, nous avons le restaurant (you have the recipes, we have the restaurant). This means that we'd get to work in a professional kitchen with professional chefs who would help us execute our own menu! My immediate reaction was that it sounded terrifying, but something that we had to do, and would be reminiscing about forever. The next thing I knew, we were planning our menu with an American food theme and writing a bio that would be posted on their website along with our menu. We were locked in for June 1st. We wanted to represent classic American food (which I hear is a growing trend in Paris right now) with a home-made, dressed up spin. with green bean casserole and fennel garlic mashed potatoes. Kelsy and I set out early for a coffee and croissant as we imagined what our big day would be like. Giddy with excitement but not sure how much we'd get to do, or how everything was going to work we quickly headed to the restaurant after breakfast to make sure we'd be on time! We arrived at the restaurant at 9 a.m. to find Ludovic, one of the chefs who would help us all day, putting away vegetables. He showed us where to put our things and where to find chef jackets to change into. Chef Jackets?! We were in the big time now. Very official. We got right to work in the kitchen, which was tiny by the way, chopping vegetables. We were set free at the counter,where a long magnet stocked with knives hung along the wall at eye level. We set to work on a large pile of potatoes, fennel, mushrooms, and onions. Then, Ludo left us alone to finish preparing the pork ribs, which had been marinading over night. It was here where we quickly picked up on the rhythm of the how this day in the kitchen was going to play out. We got to work and the work didn't stop until after lunch service when everything was clean. But it didn't feel like work since we were having a ball! As you know, I love to chop things, so this was a comforting way for me to get my bearings in a kitchen where I didn't speak much of the language. The food was the one way I was certain I could communicate what I was capable of. I really appreciated how we were trusted in the kitchen and nobody was overly concerned as to just how were were cutting the mushrooms, only that we were being safe. 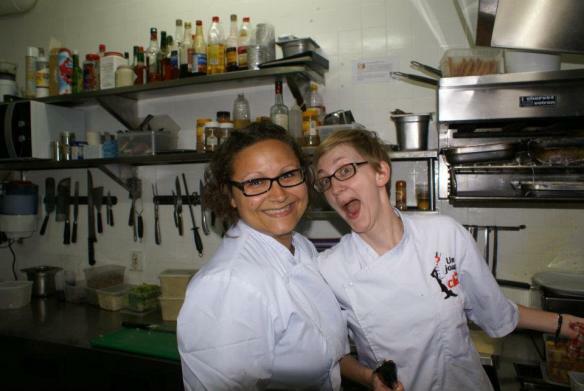 Our second chef arrived, Pauline, the pastry chef/sous chef who spoke some English. Between that and my limited French and Kelsy's translations, it was smooth sailing. While the chefs were not hanging over our shoulder at all, they were aware of what we were up to the entire time. Every so often, we'd hear "les filles, cava?" (girls are you ok?) to which I'd reply "tres bien chef! oui!" They loved to teach and share their love of cooking, and stop to give us a good kitchen tip now and then. They also never wasted a minute. Every time we ran out of vegetables to chop, something new to do arrived in the kitchen as Ludo seemed to disappear every few minutes to retrieve ingredients or run a quick load of dishes through the dish machine. After about 90 minutes of chopping vegetables, Kelsy and I prepared our chicken for the salad. This included making a spice mixture, dredging and frying the chicken strips. Then in came Ludo with a huge pile of fresh herbs for our ranch dressing. Kelsy and I tried to get this dressing to a beautiful creamy consistency by whisking buttermilk but it just wasn't working. We added cream cheese and mascarpone to the buttermilk and herb mixture, but it just wouldn't thicken. Then Pauline stepped in and saved the day. She taught us to mix the thinner liquid into the thick liquid to get the right consistency. Ah-hah!! I didn't get a picture of us making the chicken, so here is Kelsy stirring a gigantic vat of our mashed potatoes!! At about 11:30 the restaurant manager peeked into the kitchen to see if things were ready to taste before lunch service began at noon. When we finally got everything together, he tasted our dishes. "wee!! they liked our food!" First the salad, then the pork, then deserts. Every time we presented our dishes, which Ludo and Pauline showed us how to plate exquisitely (and instructionally since we'd be preparing each plate during service!!) , Eric would taste and we'd anxiously wait his reaction. It was nothing but mmmmmmmmmms as he shared it with the rest of the staff. Our ingredients were prepared and our dishes had passed the taste test! We were open for business. It seems that this restaurant, which seats around 40-50 diners at a time, was a lunch spot for locals. They could choose any dish from our menu, the chefs menu or a traditional menu. As soon as customers began to arrive, Ludovic began calling out orders in the kitchen, "deux entrees du chef, un plat du chef, !" It was time to work! Funny side note here... in French, the appetizer is called the "entree" which threw me for a loop since in America the entree is the main dish... but thanks to Kelsy I figured out that when he said entree I needed to make my salads asap! So the service continued for two hours. Orders would arrive, Kelsy and I would heat things up and plate them, place them in the window for pick up and hit the bell... ding! Kelsy plating the ribs, potatoes and beans. I think that I was one drizzling the sauce while holding the camera with my other hand! The four of us worked in harmony during the busy service and whenever there was a lull, Pauline put me to work preparing the deserts as they were going to be flying out of the kitchen any minute! At the end of lunch, the manager called us into the dining room. There sat six people finishing the last crumbs of their dinner and when Kelsy and I appeared out of the kitchen they started to applaud. I took a little bow and said "merci, merci!" while Kelsy and the diners started having a conversation in French. I tried to follow along, but the words began to flood together as my mind wandered and I took in the moment in. 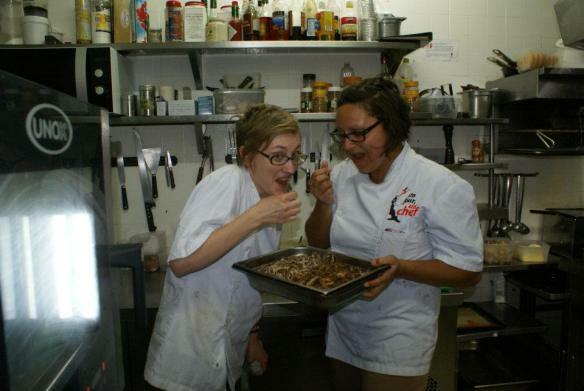 Here I was, with one of my best friends, in France, having just served our American themed lunch to Parisians. My feet hurt, my chef jacket was utterly food-stained but my heart was soaring. Find out about more Un Jour Un Chef here. If you are ever planning a trip to Paris, I highly recommend this as an adventure. It's free, but they really put you to work for the day! It was fantastic. Kelsy has also blogged about our experiences on her blog A l'Americaine. I can hook you up with the recipes if you want!! Great description of your chef for a day adventure! We've talked about it a few times, but I loved reading your narrative and seeing your pictures. Now will you post your recipes pleeease!? Great posting, I think you can make it more memorable if you use sme advanced technologies like Food processor.